Release Party (Reserve Your Books), Book Trailer, and Loads More! 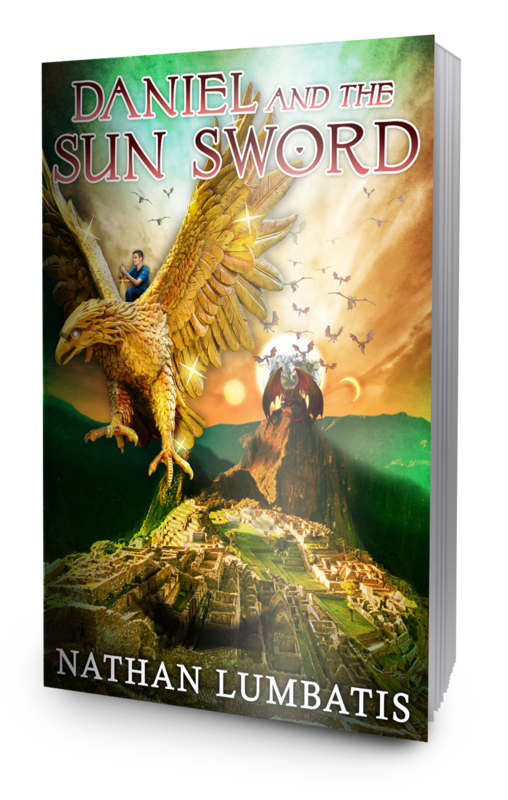 Review Daniel and the Sun Sword On AMAZON! Sorry for the delays, Everyone. But, the labor pains and the wait are nearly over. Due to shipping time and venue availability, the book launch for Daniel and the Triune Quest will be on October 7th at Barnes and Noble from 1:00-4:00. If I can get a suitable venue sooner, I’ll let you know. But, as you may know, the books are currently available for order through Amazon and Barnes & Noble! If you’d like to go ahead and order them, feel free. If you’d rather wait until the book release party so you can get a signed cope, please let me know how many of each book you’d like. I’ll be posting updates periodically. We have a physical copy of Daniel and the Triune Quest in hand! See? One last look-through to check that everything is in order and it’s off to the printer. Once that’s done, a release date will be set and the long wait will be over. In the mean time, I’m getting things ready for the release party. So, don’t forget to vote below on what you’d like to see happen! Peter Younghusband regularly reviews Christian books at the Christian Fiction Review. Since D&SS debuted, I’ve wanted him to do a review, but he was too swamped. Finally, he was able to not only review it, but also Daniel and the Triune Quest! His DTQ review will be posted hopefully in conjunction with the book’s release. But, while you’re waiting, find a brief excerpt from his review below, as well as a link to the whole post. Additionally, D&SS peaked on Amazon (probably thanks to Peter), and was in the Top 100 for one of its categories! The author asked me to review this novel in 2015 when it was about to be released but I was unable to due to a long list of author requested reviews. I have been able to now as he requested a review of the next novel in the series about to be released over the next few weeks. Now that I have read this debut novel, I realise what I have missed. This is a wild ride for a debut novel in this genre. Lumbatis writes as one who is a seasoned novelist. It is very hard to distinguish that this is his debut. On all the infrastructure that makes up a novel, a tick can be applied. The pace never slows down, the action never stops, the characters are well developed. Worldbuilding provides a solid foundation upon which everything rests. This is developed well and believable. The supernatural elements are based firmly in Biblical foundations. They are also rooted in the mythology of the geographical location and culture depicted. This is not surprising seeing that Lumbatis is writing from a Christian/Biblical worldview. In relation to the supernatural elements, I loved Lumbatis’s take on the Gospel message. The same for those of angels and demons and their various forms and names. Using poetic licence that includes artifacts that are supernaturally empowered by God to assist in defeating the power’s of darkness, does not detract from the Gospel message or compromise its tenets. To me, this shows Lumbatis’s motive to adhere to his faith and belief in the Bible and its doctrines. We are still waiting for the proof copy from the printer to ensure everything is formatted correctly. Once we get that, then a solid release date will be posted! The book trailer, however, is finished. I’ll be posting that as soon as the book is available for pre-order!